and…well… you’ll be open to it. Everyone knows the famous phrase “I see dead people” from the unparalleled movie “The Sixth Sense“. Of course, you can’t compare “We go on” with the latter. But in a way, it reminds you of it. Not that this one is terrifying and filled with heart attack causing jumpscares. So for those who think a horror movie is about demonic appearances, a multitude of bloodthirsty zombies or a psychopathic freak who slaughters innocent girls, be warned. This isn’t such a typical horror movie. To be honest, I thought the human interactions between Charlotte (Annette O’Toole) and Miles (Clark Freeman) were the most amusing in this film. And the story itself can be called original as well. He could have called the ghostbusters. Not? Miles is someone who suffers from all sort of phobias. And this because of his father’s deadly car accident when he was very young. Thus he fears to drive a car, he fears open spaces, he’s afraid of heights and he hates rotting things. Obviously he’s also afraid of dying. Should I list all the Latin names for these phobias, there’s a chance that some readers would grow a phobia to read my reviews. In other words, Miles is a real scared guy. The cure he comes up with, is on the one hand fairly inventive and on the other hand also kind of naive. If someone can prove to him there’s life after death by showing him a ghost or a spirit, Miles thinks he might be able to lead a normal life. A page-sized advertisement in the newspaper is used to draw the necessary attention. I’m sure the $ 30,000 reward is the reason why a lot of individuals offered their help. Of course there are charlatans, scammers and quacks among them. And that’s where Miles’s mother Charlotte, comes into the picture and starts helping her son with the difficult quest to find credible candidates. Even though she is convinced it’s all nonsense. Eventually there remain three candidates. The question is whether these people can help Miles. You need to watch the movie to find out yourself though. It’s only halfway the movie it gets interesting and the atmosphere becomes more sinister. And this after meeting Nelson (Jay Dunn), a seemingly dead normal guy who works as a maintenance man at the airport. He will help Miles to get in touch with the thing Miles wishes to see. Not scary but the humor is subtle. As I said before, “We go on” isn’t really creepy or frightening. But after meeting with Nelson, the film takes a whole different turn and turns into a pretty ghostly film. But generally, one tries to put more emphasis on the humorous side instead of making it creepy. Normally, I’m not I’m not so keen on humorous horrors. Usually it feels rather exaggerated with use of infantile humor and lot of mostly weak parodies of classic horrors. As in the “Scary movie” series. At first it’s a bit funny, but after a while it starts to annoy me. In this movie, the humor is more subtle and at the same time ordinary. As if it wasn’t meant to be funny. As if it just slipped in the movie by accident. I admit it. That’s the kind of humor I appreciate the most. No forced knee-slappers where a laughter track is needed to let the audience know that something funny has happened. The interaction between the two main characters is a pleasure to look at. Especially Annette O’Toole is fantastic. Both act in a spontaneous and natural way. At times it seemed as if they had a lifelike mother-son relationship. Grandiose, extremely funny and touching at the same time. For that reason they already earn a standing ovation. But the film itself deserves all praise as well. In a quirky way, the film succeeds in distinguishing itself from other ghost stories. 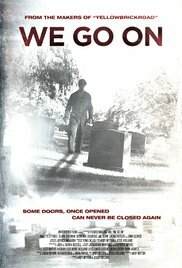 Let me call “We go on” a horror for newbies. A fascinating supernatural story without bloody scenes and palpitations-causing scares. I am convinced that the non-lovers of horror will also enjoy this. I was pleasantly surprised by this low-budget flick.